Here’s a classic Pizza Hut commercial featuring good guy David Robinson and bad boy teammate Dennis Rodman from 1995. 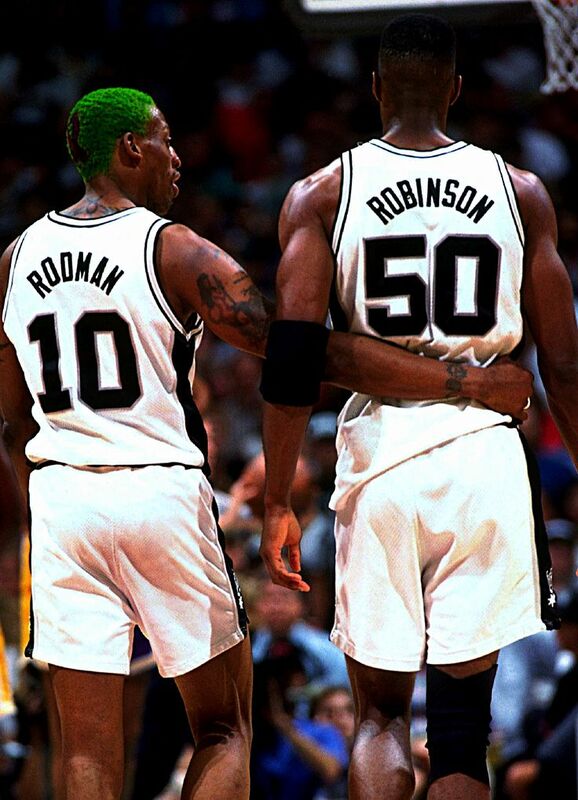 For those who remember the tattoo-less Worm from Detroit, Rodman didn’t start “acting insane” until he demanded a trade — he felt like he was living the life of an impostor in Detroit– and ended up in San Antonio. It’s near the Alama where he started dying his hair (you can also thank the film ‘Demolition Man’ for this) and dating celebs like Madonna. On the court, he was still a rebounding machine and continued to lead the league, by a very large margin, in rebounds. Along with David Robinson, the frontcourt duo averaged an insane 28 rebounds a game. But after a couple of years of clashing with the team — with the exception of cheerleader Jack Haley — and disappointing losses in the playoffs, the Spurs sent Rodman to Chicago, where he would pick up a few more championships. Nowadays, you can keep up with Rodman by following TMZ and Kim Jong-Un.